CHICAGO — The Jazz got a slap in the face a couple nights earlier and answered with quite a punch. The 31-point margin of victory was just three shy of the Jazz's season high. They raced out to a 70-36 halftime lead on the way to their sixth win in seven games, and bounced back quite nicely from a three-point loss at Atlanta on Thursday. 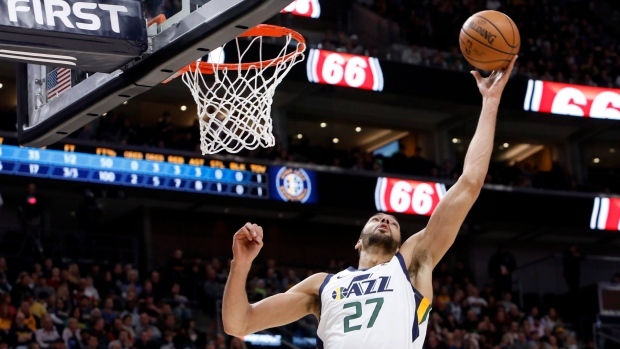 "That loss kinda was a good slap in the face," Gobert said. "I think our urgency was great tonight. We started the game the right way defensively and it just (carried to) the offence." "Tough one in Atlanta but we bounced back tonight," Mitchell said. "It really shows who we are and what we're capable of." "It would be great to have the homecourt," Gobert said. "But at the same time, like I said, if we don't, I like our chances ... on the road against anyone." "We're not using that as an excuse, that we're short with guys," Markkanen said. "We're just trying to focus on winning the second half and playing hard and together and get better. A 36-point hole or whatever it was — it's kind of hard to come back from that." The Jazz's most lopsided victory this season was a 139-105 romp over San Antonio on Dec. 4. And it looked like they might surpass that. Gobert had another neat block on Kris Dunn's fastbreak layup, setting up a break that Mitchell punctuated with a soaring dunk. Jazz: Utah's highest scoring half was 81 points against Golden State on Oct. 17. ... The Jazz had 13 players score, with seven reaching double digits. Bulls: Chicago made just 2 of 16 3-pointers. ... Shaquille Harrison set a career high with nine rebounds. ... Markkanen has 32 straight double-digit scoring games.